Say goodbye to Evan Gattis, Braves fans. The day after the Braves traded popular slugger Evan Gattis to Houston, the team’s director of public relations acknowledged the challenges of the last few months. “It’s been a really difficult off-season,” said Beth Marshall, in response to a question today at the Public Relations Society of America’s Georgia chapter luncheon in Buckhead. The Gattis trade followed earlier swaps of other “fan favorites,” as she called them — including outfielder Jason Heyward and Justin Upton. Plus, plenty of fans (including this one) are still miffed about the move to Cobb County. Marshall, on a panel with three other sports PR pros, called the trades “a necessary process for a lot of different reasons.” She said they bring not only P.R. challenges, but marketing issues, as well, since fans can’t come to see some of their favorites anymore. With so many new names on the roster, everyone within the Braves organization will have a lot to learn at Spring Training — so they can help educate the fans, in turn. 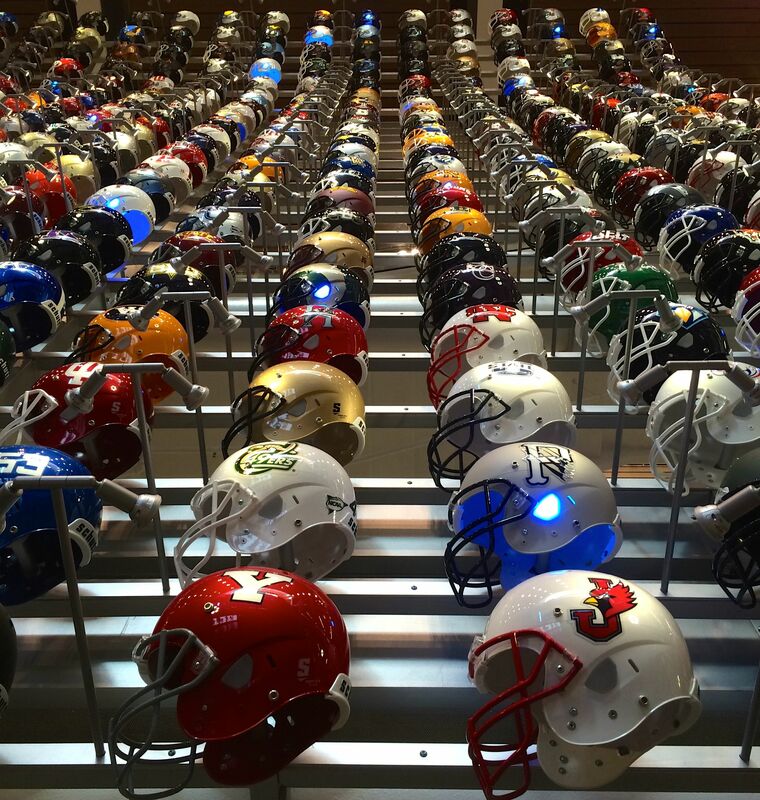 A British couple touring the College Football Hall of Fame were flummoxed. “Do people actually GO to these games?” they asked a tour guide. – from Traci Messier of the Jackson Spalding agency, which works with the Hall. The Hall activated Kia sponsorship with tailgate exhibit featuring their vehicles. That’s a good example of how corporate sponsorships have to be directly relevant for the sponsor and the event. Comparing launch successes, speakers pointed out that the Hall’s events and grand opening were spread out; the Braves held everything about their move secret until One Big Announcement. Athletes’ social media posts can help build brand — or destroy it. Marshall tells players to not tweet anything they wouldn’t say on TV. 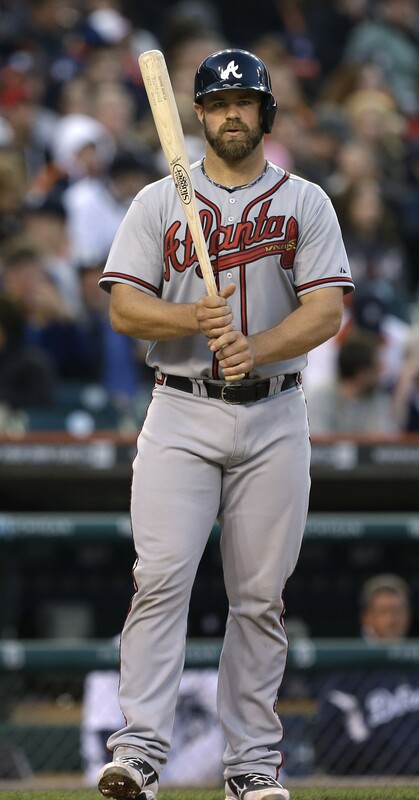 This entry was posted in Atlanta, Business Comms, Entertainment, Social Media and tagged atlanta, braves, College Football Hall of Fame, Evan Gattis, Jason Heyward, prsa, Public Relations Society of America, sports, trades on January 15, 2015 by Jay Croft. The wall of helmets greets visitors. It’s pretty impressive and lots of fun. 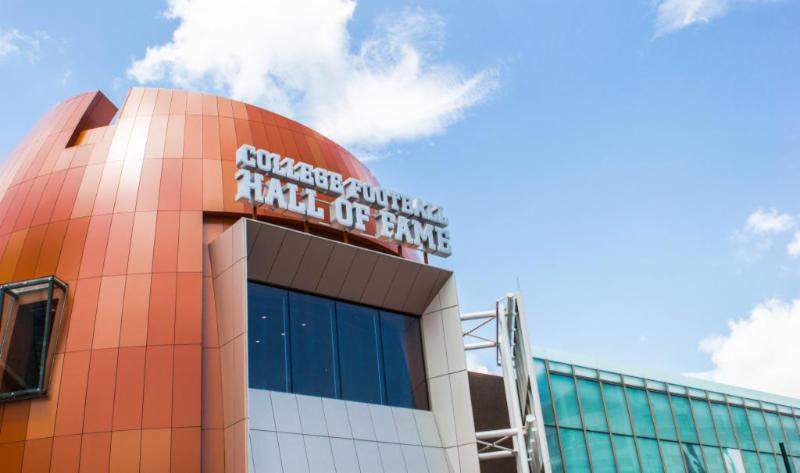 With millions of college football fans glued to the tube this time of year, downtown Atlanta is marking its first season as home of the new College Football Hall of Fame. It opened in August. It’s a beautiful facility, with more than 90,000 square feet of historical artifacts, displays, interactive features, photos and lots more. The hall is also the latest Really Cool Thing to have downtown, after the Center for Civil and Human Rights across Centennial Olympic Park. I’m not a college football fan, but I get that many people are. So if you’re watching the game and want something to look at during commercials, check out my pictures here. And plan a trip to the hall. Great stuff. Click on an image to make it bigger; mouse over to see caption. Here’s a nice touch: a wall of drawings of great coaches, by Pulitzer-winner Mike Luckovich of The Atlanta Journal-Constitution. In the history of helmets, it’s a clear choice. A kid goes for the Heisman pose in front of a replica of the trophy. This entry was posted in Atlanta, Entertainment and tagged atlanta, Center for Civil and Human Rights, College Football Hall of Fame, downtown, Georgia Tech, Tourism, UGA on October 4, 2014 by Jay Croft.